The Great Depression is the worst economic depression in the history of the United States. While many believe that Black Tuesday or the Stock Market Crash of October 29, 1929 is the major cause of the depression, these two events are not one and the same. While the crash had a major role in what happened to the US economy from 1929 to the 30s, the stock market crash was just the beginning. As the stock market plummeted, people tried to sell their stocks as fast as possible. Unfortunately, no one wanted to buy these stocks. Many Americans lost their investments. The stock market crash caused a panic across the board. Another panic followed when banks that had invested their clients’ money in the stock market lost all their investments and were forced to close down. Records show that around 9, 000 banks closed while the surviving ones protected their own assets by not allowing people to loan from them. Historians and economists alike say that the instability of surviving banks that were incapable of loaning money to their clients made things worst for the economy. Businesses suffered as well after losing a large amount of their capital in their respective banks. Other businesses lost their savings in the market crash. Many businesses across the board had to cut back in their expenditures and as a result, millions of Americans were out of work and many had no other choice but to move from place to place in search for greener pasture. Some rode the trails looking for work in towns they passed by but whenever a job opening was available, thousands lined up for that one job. At a certain point, life became more difficult and many had no means of supporting themselves. Some even had to live in shantytowns that later gained the nickname Hoovervilles. Although farmers usually did not get affected by previous financial crises, in the year 1930, the Great Plains suffered from a drought and dust storms swept the area. The area affected was later referred to as The Dust Bowl. Crops could not be grown resulting not only to hungry farming families but to food scarcity as well. At this point, small-scale farmers suffered. They had to borrow money to be able to plant their crops but because of the drought, nothing could be grown. These farmers could no longer pay their debts and were left homeless and without employment. While The Dust Bowl did not cause the depression in a direct manner, the drought that hit the Mississippi Valley made life harder for many American farmers and their families. On that same year, while millions rode the trails from one town to the next in search for work opportunities, the US government tried to abate the crisis by creating the Smoot-Hawley Tariff. Designed to look after American companies by charging high taxes for imports, the tariff caused more harm than good. There was less trade because of the tariff and this made the economic standstill more unbearable. Another one of the many causes of the Great Depression is the reduction of purchasing across the country. Fearing that the crisis will not go away soon, Americans cut back on their spending. The lack of sales resulted to companies to cut back as well. The workforce was reduced once more and those who were laid off and had no money to pay for their debts got some of their properties repossessed. Records show that the unemployment rate during that time was above 25 percent and there was little to no activity in the market. This is one of the major factors that left the United States in a financial turmoil for many years. At the most fundamental level, there was already inflation in the world’s currencies even before 1929. To support the war effort, countries involved in the war kept printing money even without ample gold reserves. World War I obliterated the Gold Standard which later led to inflation. After the war, the rest of the world spent a decade to get back on to that standard but this only paved the way for an economic collapse. While Herbert Hoover was optimistic about the country’s economic situation at the time, Americans blamed him for the crisis. Hoover did not stand a chance against Franklin D. Roosevelt in the presidential election in 1932. By the time Roosevelt was president, he closed all the surviving banks and announced that they could only reopen once they are stable. He later established the New Deal. This government program enacted between 1933 and 1938 involved executive orders and laws in response to the depression. The focus was on relief, recovery, and reform. This was relief for the homeless and unemployed, recovery for the American economy, and financial system reform to prevent another Great Depression from happening. 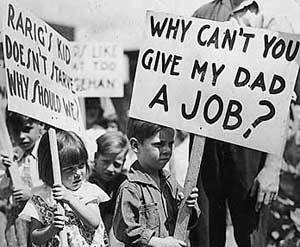 The New Deal eased the suffering of the people but the economy was still in bad shape. According to historians, the economy boomed during the Second World War since industry and manpower were very important in sustaining soldiers on the ground. There was work available for everyone. Some people entered the military while others worked for the war effort. This made it possible for those in the US, at the time, to buy everything they need. Food production increased as well to sustain not only the people back home but the people in the front lines as well. In recent years, the United States and the rest of the world suffered a recession. 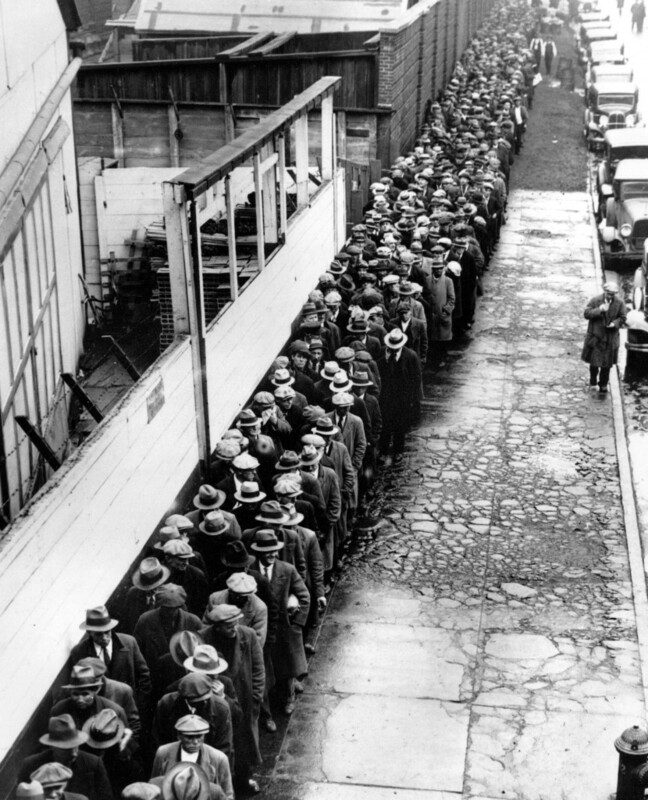 This caused many concerned Americans to ask whether another Great Depression could happen. Based on history, all major economic depressions were caused by monetary contraction in major economic centers of the world. Combined with panic, this can result to a financial turmoil. Experts believe that to prevent such a crisis, a shift in terms of monetary policies is needed and that this should be done in leading economies. The 1997 Financial Crisis gave the world quite a scare due to economic contraction.